The true story of the daredevil flying ace who rivaled the Red Baron, with photos included. This is the first full-length biography of nineteen-year-old Werner Voss, a legend in his lifetime and the youngest recipient of the Pour le Mérite, Germany’s highest award for bravery in WWI. At the time of his death he was considered by many, friend and foe alike, to be Germany’s greatest ace—and, had he lived, Voss would almost certainly have overtaken Manfred von Richthofen’s victory total by early spring of 1918. 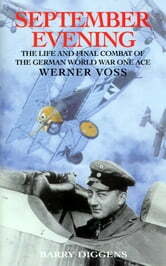 Voss is perhaps best remembered for his outstanding courage, his audacity in the air, and the prodigious number of victories he achieved before being killed in one of the most swashbuckling and famous dogfights of the Great War: a fight involving James McCudden and 56 Squadron RFC, the most successful Allied scout squadron. Yet the life of Voss and the events of that fateful September day are surrounded by mystery and uncertainty, and even now aviation enthusiasts continue to ask questions about him on an almost daily basis. Barry Diggens was determined to uncover the truth, and September Evening unearths and analyzes every scrap of information concerning this extraordinary young man. Diggens’s conclusions are sometimes controversial but his evidence is persuasive, and this study will be welcomed by, and of great interest to, the aviation fraternity worldwide.